The Future Today Prophecy Meeting will be held on the second Sunday of each month at the church office. Check the Events calendar to confirm the date of the next meeting. Click on the map below to get directions. If you can't make it, you can watch the meeting live and be involved through the Live Chat. Prophecy is being fulfilled every day! Not since the time of Christ has there been so many things happening in the world that line up with Bible prophecy. One of the things we are hoping to do with this meeting is connect current events in the world with Bible prophecy. Understanding the times we live in! God gave us prophecy so that we could know what to look for as the time of Christ's Return approaches. In addition to connecting current events to biblical prophecy we want to take a little time in each meeting to understand what the Bible teaches about the times of the end. Jesus is coming back, and it could be very soon. Let's be prepared for His soon coming! Pastor Rick and Pastor Randy will be leading this meeting together. Neither of us are experts, but we both have studied these things for quite a while. We want to take in each meeting to answer your questions on any topic, but specifically as it relates to prophecy and end-times things. 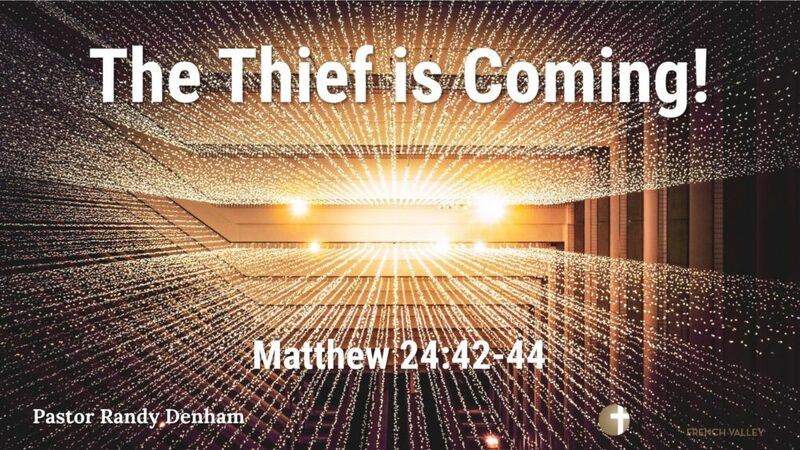 These topics could include, but won't be limited to; Christ's Second Coming, the Rapture of the Church, the Anti-Christ, the Tribulation, the Millennium, and others. There is a form below where you can send us your questions in advance. We will do our best answer all your questions. Your questions will also help us to determine where we need to focus the teaching time. Send us your questions about prophecy or world events. Pastor Randy Denham shares a Prophecy Update looking at current events and how they impact the Prophetic time table. Recent decisions made by World leaders appear to directly affect Biblical Prophecy and cause Christians to prepare for the end days’ events leading to the Rapture. Randy is an Associate Pastor of Calvary Chapel French Valley in Murrieta, California. For more information about what is going on at Calvary Chapel French Valley, go to http://ccfv.life. Looking at current events and comparing them to Bible prophecy.